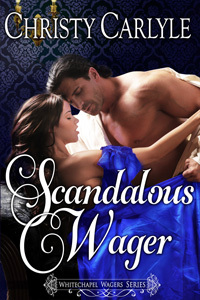 Today’s Special First Kiss February featured guest is Christy Carlyle, author of historical romance Scandalous Wager: A Whitechapel Wagers novella. 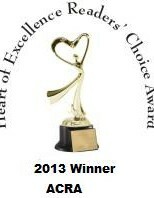 Welcome Christy, my fellow Love Historicals author! Here’s the first kiss between Elizabeth and Ian. She stood gazing up at him now, closer than they’d ever been to each other, and he studied the green and gold flecks in her honey-brown eyes. His mind still couldn’t make sense of it. Elizabeth Ainsworth in his dingy flat, her hand on his chest, asking him to ruin her. He sounded stupid, like a green boy who had no notion of what went on between a man and a woman.But he knew. And he yearned to show her everything he knew. If he had any talents as a lover, he wanted to use them to make Lizzy Ainsworth cry out his name as she writhed beneath him. But, dream or not, it was impossible. He couldn’t bed her any more than he could court her. Not yet. Perhaps after he’d risen in the police force, achieved the status and financial security her father had. Achieving such a rank, proving his father wrong and making his mother proud—God, rest her—was all Ian had ever wanted. He had listened to his father tell him he was nothing for enough years to make becoming something a priority. It was the desire that fueled him, pushed him to work longer hours, to ask for more work, to say yes whenever a task arose, and it had gotten him an inspector’s rank long before others of his own age and experience could even smell the title. His work meant everything to him. And it was the reason he couldn’t spread Lizzy’s long legs and bury himself in whatever heaven he’d find there. Ned Ainsworth would never promote him and he’d have his headif he dared to touch one of his dignified daughters. Heaven help him, he touched her. He couldn’t resist. Lifting his hand, Ian cupped her smooth cheek. God, she was soft. And warm. And willing. Her mouth opened slightly and he took it. He tried to be gentle and failed miserably. Her lips were full and so damn sweet. Sweet and wet. He tasted her with his tongue, plunging in deep, his mouth moving over hers, pressing into her, claiming her in the only way he could. It was hard to pull away. As hard as the evidence of his desire for her between his legs. But even if she’d gone momentarily mad, he had to be sane and return her to Ainsworth unspoiled. His livelihood depended on it. He rested his forehead against hers for a moment before withdrawing, trying to catch his breath. She made a tiny whimpering sound as they separated, and it nearly unhinged him. The ache in his groin was nothing compared to the burning sensation in his chest at the notion he’d disappointed her, the notion that he had squandered the most extraordinary opportunity he’d ever been given. He began to doubt anything Detective Chief Inspector Ainsworth offered him in terms of success and advancement could truly compare to the pleasure of claiming Lizzy. Thanks so much for featuring my first kiss from my debut novella, Laurel!